Bold new cell phone (PDA) offering from Nokia. A 5 megapixel camera is pretty tantalizing, not to mention 48 gigabytes of memory. Nokia N97: Nokia launches 'iPhone killer' N97 phone - Telegraph. The Finnish mobile phone giant has dubbed its new N97 handset the "world's most advanced mobile computer", and promises it will bring users closer to the internet on the move. The device combines a large 3.5in touch-screen, similar to that found on the Apple iPhone, with a slide-out Qwerty keyboard reminiscent of the Sony Ericsson Xperia X1 and the T-Mobile G1. Unlike the Apple iPhone, the N97 will be able to play the Flash videos used on many websites, including our own Telegraph news pages. It also supports instant-messaging and email on the go, boasts a five-megapixel camera, and a huge 48GB of memory, capable of storing thousands more songs than the Apple iPhone and many other leading devices. If you are on the Mac platform, but are using the Parallels virtual machine (VM) to run Windows so you can sync your Palm (or similar) device with, say, Outlook, this might be useful to you. I discovered today that the reason Windows was not seeing my Palm when I plugged it into the sync cable, is because I didn't have the Parallels "Tools" program installed properly. Not sure what happened to it but maybe it got corrupted or something. In any case, reinstalling it fixed the problem of Parallels not picking up the Palm when I had it plugged in (which was really why Windows wasn't seeing it either). Tools is a program that sits between Windows/Parallels and the Mac operating system and lets the two operating systems "talk" to one another. It allows you to do all sorts of things like share folders between Mac and Windows, mesh the two operating systems together (so the windows appear to be operating as one cohesive OS--called Coherence--it's pretty neat), and so on. I had been cleaning the connections on the Palm and assuming there was something physically wrong with it or the cables. Turns out it was just Tools needed to be reinstalled. Once I reinstalled them and restarted Windows (important! ), all was well again. Take a good look, friends. Last week I met a fast-moving businessman who had been trying to keep up with his email and texting through his Blackberry (aka: "crackberry") device and in the course of doing so got broadsided by another vehicle just a day prior to my meeting him. He and his truck rolled three times before coming to a stop. Lucky for him, he was able to walk away. He could have just as easily died or, just as worse, killed someone else. Modern technology is indeed a wonderful thing. But it carries with it a responsibility. If it is so important you respond to someone's mail or send someone something, it's worth the few seconds of your time to pull over and give it your full attention. I'd like to note that my new friend is not the kind of guy who has any mental problems--he's no loser. In fact, he's a top professional in his field which is an area of "high finance." This fact underscores that these little devices can indeed be difficult to put down and therefore the amount of sheer intention you might have to bring to bear in order to do so. I'd appreciate it if you'd spread this word. If this guy was txt'ing while driving, you can bet there are others who are tempted to do so and often give in. The email can be handled later. Getting (and keeping) a life is something you don't want to put off. The real test of Apple's mettle in this situation isn't going to be whether or not bugs or holes like this are found on their new and innovative phones, but how efficiently the holes are effectively plugged. Knowing Apple, they'll probably be able to push out a fix to all the existing iPhones (rather than making their owners jump through hoops by having to download files and install them). One of the features I enjoy with my Treo 700p with Sprint is that I can dial *2 and if there is an update available for my phone service, it is detected automagically and downloaded to my phone right there. That's the kind of low-hassle, hi-tech fix that can make a customer want to stay with a provider for a while (aka: create "stickiness"). If this is a real iPhone security issue, I'll be interested to see how what the average iPhone user has to do in order to fix it on their own iPhone. Link: IPhone Flaw Lets Hackers Take Over, Security Firm Says - New York Times. A method to the iPhone madness? ZDNET round up on the iPhone hysteria. Pretty good. Link: A method to the iPhone madness? | Tech News on ZDNet. Here is that other line I mentioned below. Go Mac-ophiles! 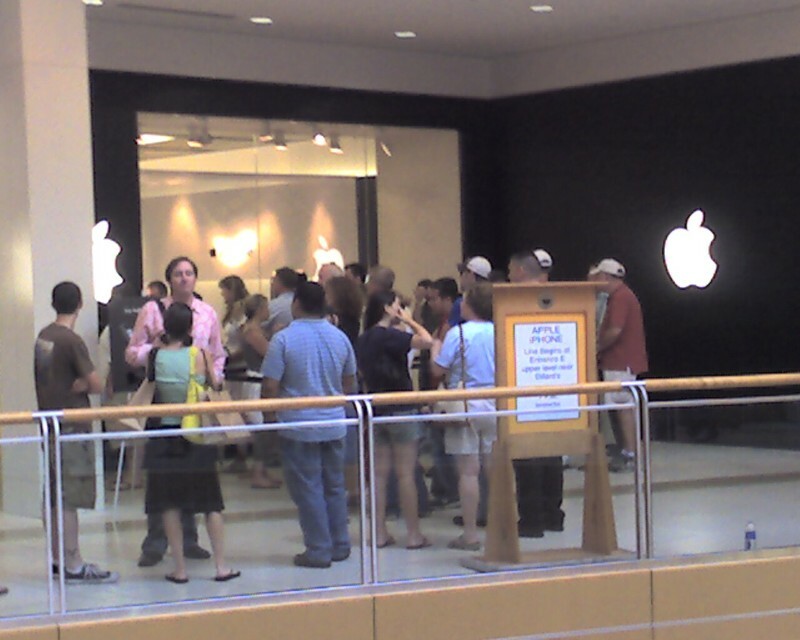 Here I am at our local mall's Apple store thinking I might be able to get in and touch the new iPhone. Ha! And this photo you see isn't even the real line. The rest of them are about 50 yards away, piling up behind a slightly bemused security guard. There is so much Geek Energy in the air, it is almost arcing off the overhead fixtures and gawking passersby. I don't remember seeing this much technological excitement since the first Star Wars movie release as a young boy! Still, I think I will sit this early adopter round out and see how the reviews play out. Somehow I managed to be part of the testing group for the new Plaxo 3.0. We testers are all sworn to a certain amount of secrecy, but I don't think they'd mind if I said it's going to be pretty neat once they get some of the initial kinks worked out. One of the things I'm looking forward to the most is the ability to synch with more of the other online services out there that people are using these days, like Google and Yahoo. Plaxo will probably end up being the only "middleware" out there that reliably works to link multiple, disparate online productivity suites with desktop programs like Outlook, Thunderbird or the Mac productivity products. As soon as I can write more about the test results, I'll do some more posting here.